Tesla said the vast majority of these issues have been corrected and noted Consumer Reports’ surveys show its vehicles rank among the highest in customer satisfaction. Tesla's Model 3 lost a coveted recommendation from Consumer Reports, dropping its brand from the top 10 of the U.S. magazine’s closely watched annual ranking. The top brand in Consumer Reports’ 2019 auto issue is Subaru, which rose six spots from a year ago and bested several premium-car lines to lead the rankings for the first time. The magazine recommends seven of Subaru’s eight vehicles sold in the U.S., including the new Ascent sport utility vehicle. It earned the “top pick” designation among mid-size SUVs. Genesis, Hyundai’s luxury brand, took second place after Subaru in the ranking, slipping from No. 1 last year. The others in the top five also are premium marques: Porsche and Audi, followed by Lexus. The lowest-ranked brands are Jeep, Mitsubishi, Land Rover, Jaguar and perennial bottom-dweller Fiat. Four of Fiat Chrysler Automobiles NV brands were among the 10 worst, with Chrysler falling 11 spots. The magazine dropped its recommendation for the Chrysler 300, citing problems with the sedan’s electronics and transmission. Consumer Reports said Tesla owners have complained about issues including loose-fitting exterior parts and defective glass, casting doubt on the Model 3’s reliability and costing the car its recommendation. The sedan’s fall from grace contributed to Tesla dropping to No. 19 in Consumer Reports’ brand rankings, down 11 spots from last year and its lowest ever. The dropped recommendation follows two Model 3 price cuts this year to partially offset lower federal tax incentives. The moves have raised concern among some investors about demand for the vehicles keeping pace after deliveries surged in the second half of last year. “All three Tesla models have below-average reliability, and we don’t recommend any of them,” said Jake Fisher, director of auto testing at the magazine published by the nonprofit group Consumers Union. 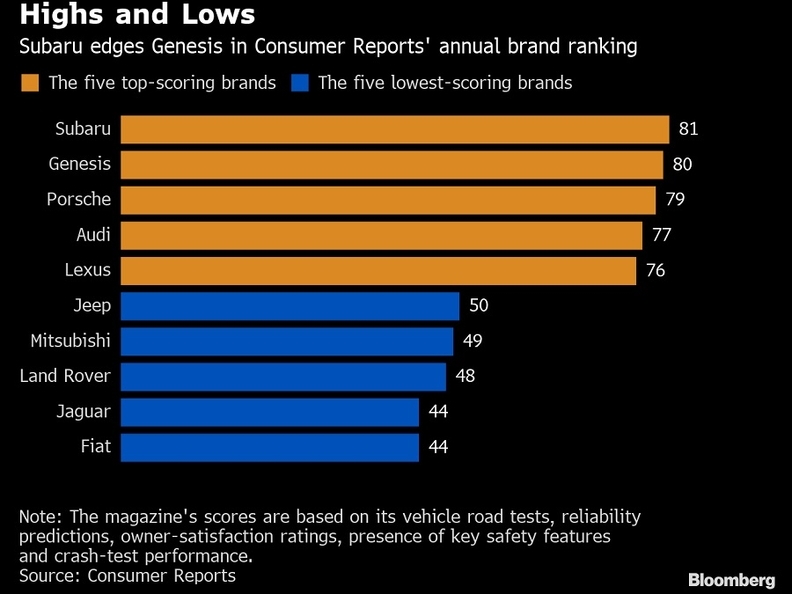 Consumer Reports has built up the credibility of its ratings by refusing carmakers’ advertising dollars and restricting the companies from using its recommendations in marketing campaigns. Tesla pushed back on the magazine’s assessment. “Not only are our cars the safest and best-performing vehicles available today, but we take feedback from our customers very seriously,” the company said in an emailed statement. In 2018, Consumer Reports ranked Tesla eighth out of of 33 brands, making it the top American marque and the only one in the top 10. This year, Tesla fell behind Ford Motor Co.’s Lincoln and General Motors Co.’s Buick. The magazine rates brands based on owner-satisfaction surveys and its own road tests and reliability predictions. 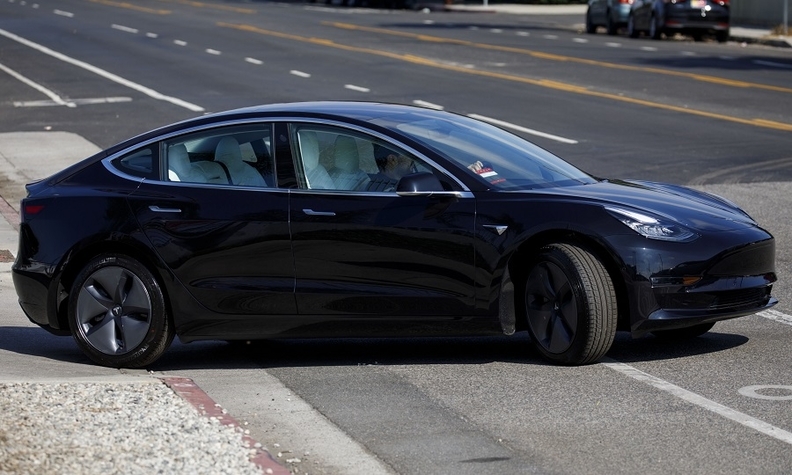 The Model 3, which started deliveries in the second half of 2017, was initially denied a recommendation by the magazine last year. But Consumer Reports quickly revised its assessment after Tesla addressed a braking issue with an over-the-air software update. The magazine similarly went back-and-forth with its ratings of the Tesla Model S and Model X in 2017, docking points and then re-awarding them after the company restored an automatic emergency braking system. The Model S then lost its buy recommendation again last year, when Consumer Reports cited issues with its door handles and suspension. Tesla’s Model X SUV has consistently rated poorly due to problematic doors and display screens. While Consumer Reports initially predicted the Model 3 would have average reliability, it’s turned out to be below average. “While most Tesla Model 3 owners are very happy with their cars, they’re also having problems with them,” Fisher said. That kind of love-hate relationship isn’t uncommon for iconic vehicles with persistent quality issues, such as the Jeep Wrangler and Chevrolet Corvette, he said. Trouble with the Model 3 includes rear windshields that are susceptible to stress fractures, which won’t be fixable with a software patch, so Fisher said another re-rating in the near term is unlikely. He said Tesla told Consumer Reports it’s remedied problems on its Model 3 production lines, but that doesn’t help cars already sold with glitches.